MANCHESTER-FEB 13: Linkedin website home page on Feb 13, 2014 in Manchester, UK. LinkedIn is a social networking website for people in professional occupations. The site is available in 20 languages. Linkedin Groups can be a great pond to fish in for your marketing efforts. You’d be surprised at the connections you can make by just making it a point to join, listen and participate regularly in groups that are related to your business. While LinkedIn is usually associated with B2B businesses, owners of local or B2C companies can also use LinkedIn Groups to network with business development partners, civic leaders and other people who might be helpful to know. Check out these 7 tips — from beginner to ninja-level — for smart ways to use LinkedIn Groups as part of your marketing strategy. 1. You can only join 50 LinkedIn Groups at a time, so you’ll want to choose wisely. Consider, too, the realistic number of LinkedIn Groups your schedule will allow you to interact with in a meaningful way. 2. Know a few people who mirror the professional interests or aspirations you have for yourself or your business? Check out the bottom of their LinkedIn profile to see which Groups they belong to. They may be good choices for you to join, too. 3. Before you join a Group, make sure that its quality meets your standards. Does it have a low spam-to-value ratio? Are people sharing only their own blog posts? Or other helpful content? Are they adding their own observations and insights to the content their sharing? Do the members seem like the kind of people you should get to know? Before you join, have a look at who else is a member. 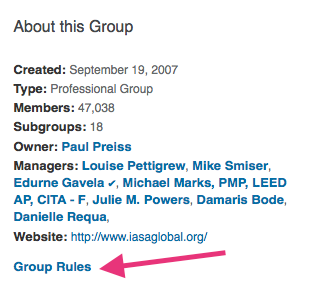 LinkedIn will actually show you which, if any, members of your existing network are also members of the Group. Does the group have rules that will help to uphold its quality? For Open Groups (i.e. groups which you do not need the moderator’s permission to join) you can view the Rules in the sidebar on the right side of the page. The discussion area is dedicated to actual dialogue. It’s a ‘no links zone’. To start a the discussion area, please submit a question or comment to the group that stands alone without links to outside promotions. Adding a link in a response to someone’s question is absolutely appropriate, as long as it furthers discussion and has context around it. 4. When you start a discussion, or comment on someone else’s discussion, the headline that appears under your personal LinkedIn profile will be visible. So be intentional when choosing your headline as it’s a great way to reinforce your or your company’s branding — everywhere on LinkedIn but especially when participating in a Group. 5. If you comment on a discussion and want to make sure you don’t miss out on the ensuing responses, use the Follow option. Depending on the settings you use, you will be able to get emails sent to you to keep you informed of others’ reactions. 6. LinkedIn generally forces you to pay for the privilege of sending InMail to people who are not among your 1st degree connections. However, you can actually send a free message to anyone who is a member of the same Group as you, even if they are not your first degree connection. This is great for reaching out directly to potential leads, especially if you’ve already warmed them up by conversing with them. Here’s how it works. You can send 15 free InMails to fellow Group members each month. This limit applies across all of your Group memberships in total. The free credits cannot be saved and carried over to subsequent months. You have to: (a) be a member of the Group for at least 4 days, and (b) be a member of LinkedIn for at least 30 days in order to use this capability. Replying privately to a discussion that someone has posted counts as one of these messages. 7. If you create your own LinkedIn Group you can send an email to all members once a week. Yes, an email. That lands in their actual inbox, outside of LinkedIn. Of course, with this power comes great responsibility to make sure your group is well-managed, frequently updated and worth your members’ times. But doing so can provide you with a great way to spring to the forefront of your members’ attention. Over to you…how are you using LinkedIn Groups? Have any favorite Groups you would recommend to the rest of us? This article was written by Jeniece Primus from Business2Community and was legally licensed through the NewsCred publisher network.